represents a trainable recurrent layer that takes a sequence of vectors and produces a sequence of vectors each of size n.
includes options for initial weights and other parameters. GatedRecurrentLayer[n] represents a net that takes an input matrix representing a sequence of vectors and outputs a sequence of the same length. Each element of the input sequence is a vector of size k, and each element of the output sequence is a vector of size n.
The size k of the input vectors is usually inferred automatically within a NetGraph, NetChain, etc. The above definition of GatedRecurrentLayer is based on the variant described in Chung et al., Empirical Evaluation of Gated Recurrent Neural Networks on Sequence Modeling, 2014. 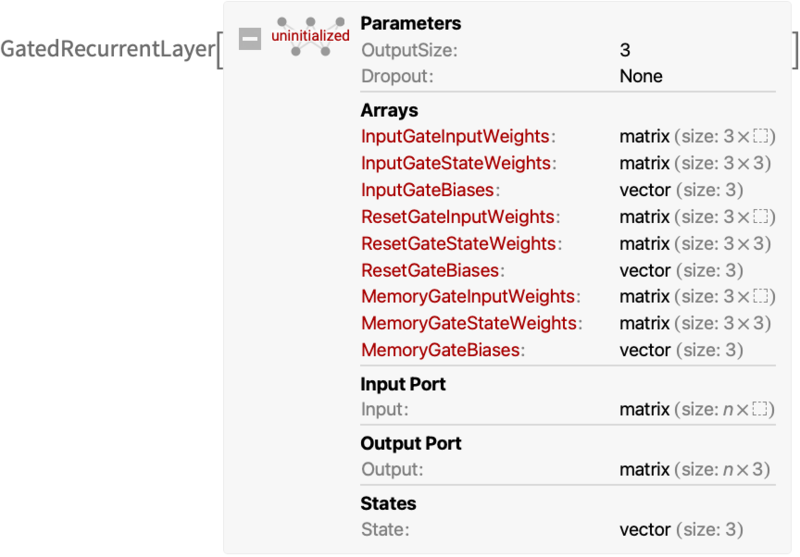 GatedRecurrentLayer[n] also has a single state port, "State", which is a vector of size n.
Within a NetGraph, a connection of the form src->NetPort[layer,"State"] can be used to provide the initial value of the state for a GatedRecurrentLayer, corresponding to s0 in the recurrence relation. The default initial value is a zero vector. Within a NetGraph, a connection of the form NetPort[layer,"State"]->dst can be used to obtain the final value of the state for a GatedRecurrentLayer, corresponding to sT in the recurrence relation. NetStateObject can be used to create a net that will remember values for the state of GatedRecurrentLayer that update when the net is applied to inputs. In GatedRecurrentLayer[n,opts], initial values can be given to the trainable arrays using a rule of the form "array"->value. GatedRecurrentLayer[n,"Dropout"->spec] indicates that dropout regularization should be applied during training, in which units are probabilistically set to zero. Specifying "Dropout"->None disables dropout during training. Specifying "Dropout"->p applies an automatically chosen dropout method with dropout probability p.
The dropout methods "VariationalInput" and "VariationalState" are based on the Gal et al. 2016 method, while "StateUpdate" is based on the Semeniuta et al. 2016 method and "VariationalWeights" is based on the Merity et al. 2017 method. When given a NumericArray as input, the output will be a NumericArray.